Last week was a busy seven days in the world of Salesforce. Not only did the Salesforce1 World Tour event land in London, but the release notes for the upcoming Summer 14 release were published. As you’ll know, whenever a new release’s documentation is unleashed into the wild, any number of blogs start appearing regarding its content and the new features to watch out for when the release goes live. But in this article, I’m going to defy convention a little and talk about something that isn’t in the release notes, even though its impending arrival been confirmed by Salesforce. It’s mid-morning on Thursday 22nd May and as around 10,000 people look on, Fergus Griffin, Salesforce’s SVP of Solutions and Product Marketing, takes to the stage in London. He talks about how the Salesforce1 app and platform can help us all to run our businesses from our phones, and he begins by focusing on how employees will benefit from the application. As he eloquently gives more information, the below slide is shown on the big screens. Wow – offline data access! And double-wow – it’s coming in Summer 14! One of the few remaining barriers to adoption for Salesforce’s next generation mobile app is being lifted within the next couple of months. Excellent news! But wait, the release notes for Summer 14 are out, and I don’t remember reading about that in there. So what’s going on? 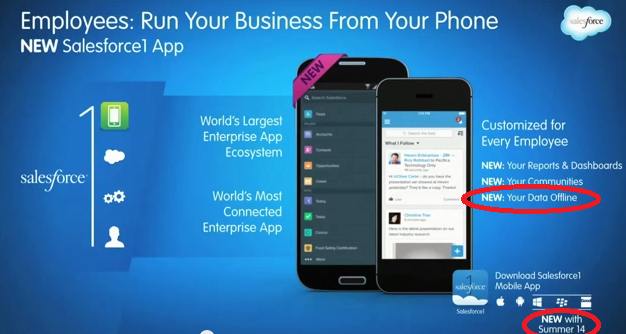 Is offline data access for Salesforce1 included in the next release or not? I felt this was very unclear, so I sought confirmation from Shawna Wolverton, Senior Director of Product Management at Salesforce. 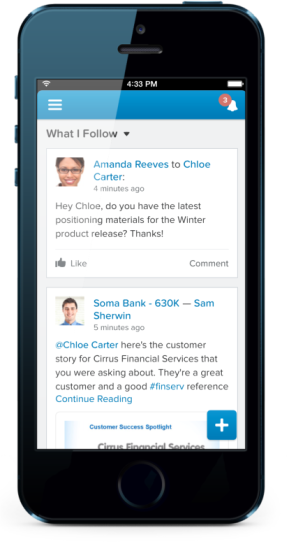 And – good news – Shawna and her colleague Marcus Torres confirmed that offline functionality will be included in the next version of the Salesforce1 mobile app when that is released in July. It would appear that the Summer 14 release notes will be updated when that happens, though why it’s currently completely absent from the release notes (rather than being mentioned as an upcoming feature with an out-of-cycle activation date, as usually happens) is unclear. There is one caveat, however. The initial release of the offline functionality will be for read-only data access. You will still need a live data connection to make changes to any records. That’s a drawback, clearly, but it is in keeping with the ethos surrounding Salesforce1 – the company is getting an excellent app onto the marketplace with most features available and is committed to building on that solid foundation piece-by-piece until all existing functionality has been successfully transitioned across to the mobile platform. As for when full read-write functionality will be added, we don’t yet know for sure. But in an interview with Desynit’s Matthew Morris at the Salesforce1 event, MVP Keir Bowden mentioned that it is still a couple of releases away (Safe Harbor!). Until then, anyone critically needing offline mobile data access does still have the option of using the (limited, deprecated) Salesforce Classic application, but at least we can be sure that before too long, that compromise won’t be needed and full offline access will be available within the Salesforce1 flagship product. UPDATE (04/08/14): Version 6.0 of the app is now available! See this Success Community post and this Help and Training article for further information. This entry was posted in Platform, Releases, Uncategorised and tagged London, Mobile, New Features, Offline, Release Notes, Roadmap, Salesforce1, Salesforce1 World Tour, Summer 14. Bookmark the permalink.